265 Indigo Loop is a beautiful three bedroom contemporary home and rare gem in the elite community of Emerald Bay. This gated community offers one of the best golf courses in the area with a beautiful clubhouse and lighted tennis courts. 265 Indigo Loop is conveniently one level with a spacious open floor plan and two car garage. There is beautiful curb appeal with welcoming landscaping and nice design features like cathedral ceilings and hardwood flooring throughout. The living area features a fireplace and recessed lighting. Double French doors offer spectacular views of the manicured pristine golf course. This home comes with a gourmet kitchen with granite countertops, new stainless steel appliances, breakfast nook and an additional wet-bar. 265 Indigo Loop is perfect for entertaining year round and in a prime location! There is ample storage within the home with plentiful cabinets in the kitchen, nice size laundry room with full size washer and dryer, and large closets. The master bedroom for 265 Indigo Loop is impressive with a great amount of space, nice archway leading to the double closets and a beautiful en-suite bathroom. The bathroom is complete with a Jacuzzi tub, stunning marble shower, and double vanity with granite countertops. There are two guest bedrooms and a nice guest bathroom with a walk-in shower. There is also an additional half bath for convenience. Enjoy the back patio overlooking the golf course and have access to Emerald Bay amenities including the community swimming pool and two Rubico tennis courts. The community is centrally located along the shores of the Choctawhatchee Bay between Destin and the Beaches of South Walton. 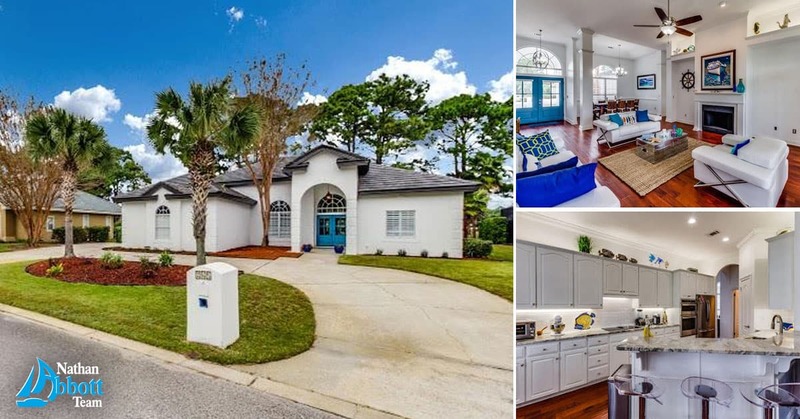 265 Indigo Loop is in great condition and a fine opportunity to own in one of the most desirable communities of Destin! 265 Indigo Loop is a rare gem in the elite community of Emerald Bay!